How do I check the status of my current orders ? You can log into your account and check the order status in the "Orders" section of your account. What do different order status mean ? On Hold - The order is currently on hold as the payment details have not yet been confirmed. Processing - Payment has been received and the order is being processed. Cancelled - The order was cancelled either due to unavailability of parts or was requested by the customer. Shipped - The order has been processed and shipped, the shipping details are also communicated to the customer. The delivery charges are as per actuals and would depend on the weight of the items, typically heat-sinks and transformers would have higher shipping costs compared to smaller parts like IC's or capacitors etc. The rates would be typically calculated per KG for heavy items. How are the items packaged ? All items are carefully packaged as to avoid any form of damage. We ensure the package is water proof with plastic wrap . All items are delivered through reputed courier partners. You will receive a Tracking ID for your order once it is shipped. How can I cancel items in my order ? You can cancel an order if the order has not been shipped already. if the order is shipped we cannot cancel it. You can call us or mail us to cancel your order. How do I pay for a purchase ? We accept payments through all major debit cards, credit cards and netbanking through our payment gateway with Payu. 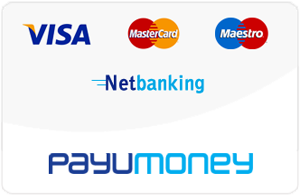 All card and netbanking transactions are done on ssl secured Payu site and is highly secure.